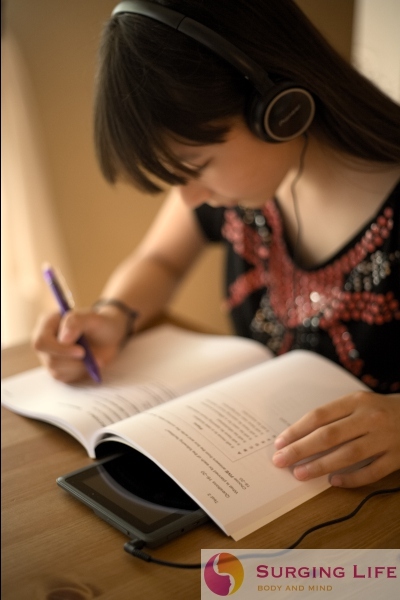 Binaural Beats For Studying help you to get an edge that heightens your powers of concentration and memory. When your mind is in a certain frame then information flows in and gets recalled and worked with in a very smooth and easy way. Alpha brainwaves are great due to the positivity they bring, Theta brainwaves though are what give rise to the Super Learning State. A state whereby you have you mind in top form for studying. Different from Peak Mental Activity which has maximum concentration, Super Learning brought by Theta creates a balance which brings optimises you for understanding and working with knowledge effectively. Listening to brainwave entrainment that gets you in this state is thus highly beneficial to anyone doing any type of studying. How Do Theta Brainwaves Bring Me Into The Super Learning State? When you are in Theta you are in a much more receptive state information wise. When you are in this state your mind is also far more relaxed, one of the keys to effective learning. So things that you are learning and going over can flow into your memory with greater ease. When you are tense and under stress you are actually causing a bigger challenge with your mind. Stress releases a hormone known as Cortisol, one of the effects of Cortisol is that it reduces cognitive function, thus limiting your ability to comprehend and memorise information effectively. So by being in a state of greater ease you feel less stress, you produce less Cortisol, and accordingly your neurological and cognitive functions improve in a dramatic way. Theta is a state that many meditation practitioners take a great deal of time to get into, it is much deeper than most people are able to achieve during their waking time. It brings with it a level of trance which can be incredibly useful though. When you go into trance your brain side steps a lot of the things which limit the passage and flow of information. It enables you to take certain processes out of the equation, and thus achieve the best of whatever you are studying. In short it enables you to download information into your mind more efficiently when you are studying. How Do Alpha Brainwaves Help Me Study Better? Alpha Brainwaves do a number of things to your mental state which are beneficial here. One of the first things is they actually cause a certain level of relaxation, something which is very good. Alpha brainwaves only bring a very light degree of relaxation, though the little they do bring has the benefit of putting your mind in a stronger state for assimilating information effectively. On top of this they also induce a light degree of trance, something which helps you to assimilate knowledge on a deeper level, as compared to the Beta range that most are in during study time, and enable better comprehension. On top of this Alpha brainwaves are associated with a good sense of positivity. Thus when you are using Alpha Binaural Beats for brainwave entrainment during study you associate positive feelings with what you are doing. Any time that you do something and feel positive while you are doing it you enjoy it more and achieve more for doing it. So the induced sensation of joy and positivity from the Alpha rhythms within the entrainment tracks help you to feel good about what you are studying, positive about it, all on top of the other benefits that help you assimilate the information and knowledge more deeply than you would have before. Do Binaural Beats For Studying Help You In The Long Term? Of course there are benefits from using these binaural beats in the short term, peak improvements in learning and acquisition of knowledge. This will help you to ingrain the knowledge on a deeper level, and in a way that you can access and use the knowledge more easily. Though there is further benefit too. Through using binaural beats for studying regularly you get into a pattern. Your brain gets into a routine and learns what you wish to do when you study. As such the repetition helps you to get your mind into gear faster and more effectively whenever you are learning. It is recommended that you use the entrainment tracks daily for a maximum of 2 hours for the first 30 days, within that time you can build solid mental routines in your mind. Thereafter your will find that you learn more effectively even without the tracks. Of course continuing to use them will help you further, and also deepen their effects. The recommendation is to go to the Binaural Beats For Studying Download section, listen to the samples, read the descriptions and decide which tracks are going to be the best for you then download and start using them. They will help you make your life easier, in both the short and longer term. These brainwave entrainment tracks really do help you study more effectively. The "Super Learning – Music For Studying" is highly recommended, with its balance of Alpha and Theta wave music, along with special Solfeggio frequencies, it has been specially developed to aid your learning in the best way possible.